The blind and visually impaired dogs listed below are in shelters and rescue groups throughout the United States and Canada. They are listed as a courtesy and are not affiliated with Blind Dog Rescue Alliance. BDRA has not evaluated these dogs, and makes no guarantees to their temperament. If you are interested in adopting any of these dogs, please contact the shelter or rescue directly. This gentle soul is Frank. Not only is he completely blind, but he’s a senior boy at 9-1/2 yrs. old with no home or family. Frank came to the Butler County Humane Society in Renfrew, PA as a stray six months ago and has been cared for and loved by our staff and volunteers, but Frank needs a place to call “Home”. Day after day people come and go, and there just never seems to be any interest in the senior dog with special needs. Walk by Frank’s kennel and you’ll see him sprawled out on his cushy pet bed with his two front legs in front of him and his head resting on his paws. He’s as quiet as can be, never joining in on the chorus of barking by the other dogs around him. But his whole demeanor changes when a familiar voice approaches and he hears his kennel door open. His face visibly lights up as he prances around with excitement. He knows someone is about to take him for a walk or spend one-on-one time with him. Frank thoroughly enjoys human companionship and going for a leisurely stroll… oftentimes with his favorite toy in tow. He LOVES squeaky toys so much that he’s even been known to carry one around as he walks, face beaming, without ever letting it drop the entire time. We can’t fathom how this loveable boy ever found himself homeless, but it was obvious when he came to us that he had been well-fed. All efforts were exhausted to locate his owner and indicate that he was likely abandoned. This would be a traumatizing experience for any dog, but that much harder on an older dog with a disability. Frank deserves to spend his golden years in a peaceful and quiet environment without stress, and with the stability of his very own family. Because of his age and disability, Frank would need to be in a home without stairs and young children. Please contact the Butler County Humane Society at 724.789.1150 with any questions or e-mail Info@butlercountyhs.org. Lucky is a 4 yr old Mutt with Diabetes. He’s about 14 lbs and the sweetest and most easy going fella. Lucky came to our rescue Precious Pals Pet Rescue in Los Angeles in August 2018 after his family took him to a vet hospital to have him euthanized because they couldn’t care for his medical needs. They never treated his diabetes, which caused him to be severely underweight and to go blind. The hospital reached out to us to see if we could help him. We agreed to take him into our rescue no matter the cost. He has come a long way getting him regulated and healthy after three major hospital stays. We are happy to report he is at a healthy weight, regulated with 2x twice a day on Novolin. We are looking for an adopter or forever foster so we can continue to cover any of his major medical needs. Lucky loves people, has no issues with any other dogs, loves going on walks and navigates perfectly wherever he’s at by his perfect sense of smell. He loves to play with dogs his size or larger and is the biggest kisser ever. Click here to see a video of Lucky. 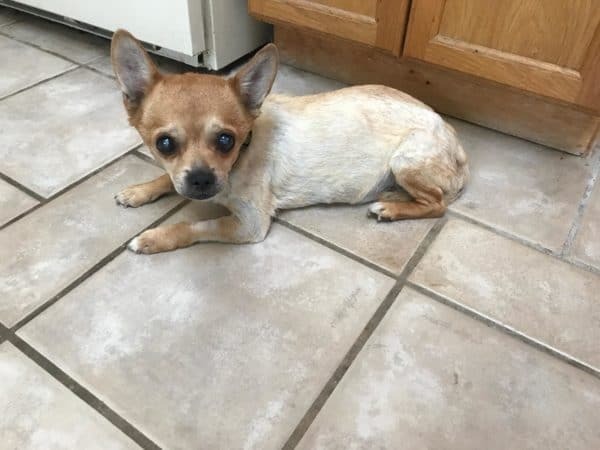 Two year old Papito is a Chihuahua mix who sadly is blind due a congenital abnormality. He is nothing but love. He loves his toys and his people and other dogs. We are seeking a quiet, loving, adult-only home for this very special and very sweet young man. You must go slow with Papito as he startles easily. He is very loving and would love a family to love him right back. To view a video of him please click here. Seven year old Jada and her best buddy, eight year old Sadie, are a truly bonded pair – and they’re both blind. Although Sadie, a neutered male, is blind he always knows where Jada is – and she relies on him. When they go for leash walks with their mom, Sadie is the leader and he walks ahead of his mom and Jada follows behind her – it’s quite the parade. Our vet diagnosed Jada with juvenile cataracts and we hope they’re operable and she can regain some sight. Sadie has cataracts and glaucoma, he’s now on two eye medications to help reduce the pressure in his eyes. The immediate need is to find a loving, caring adult only home for these two special cockers. CSRNE will pay for all ophthalmological care and medications. Our vet said both dogs are otherwise in good health. Sophia is a very, very sweet 4-6 year old chihuahua mix weighing about 10 pounds. She gets along well with dogs and cats, but all she really wants is to be with her person. Sophia follows her foster mom everywhere and at night will dance on her back legs to get her mom over to the couch where they can snuggle together. Sophia will come running from anywhere in the house when she hears her name called! Sophia is good with the teenagers in her foster home, but like many small delicate dogs, she would prefer a home without small children. Sophia is very well house trained and sleeps quietly in a crate. She is very relaxed and just loves cuddling and giving kisses. She does have early onset cataracts and is mostly blind. She gets around just fine, but it can make her a bit nervous in new situations. Sophia is spayed, up to date on vaccines, negative for Heartworm and Lyme disease and come with a microchip. To apply to adopt Sophia please click here. Dislikes: New places, they are scary! My name is Zoe and I am a 2 year old German Shepherd. I am blind and likely was born without sight, as I am very adept at getting around by using my nose and ears. I would love to have an active, patient couple with another dog and maybe even older children to play with. I am still very much a puppy and have a lot to learn, so patience is a must! I maneuver around my foster home and yard very well but I would prefer to have you at my side to talk to me and guide me until I learn my way around. Once I’m familiar with a space, I love to run around and play ball, roll in the sunny grass, and play with my doggie friends. Occasionally I don’t recognize other dogs giving me signals that they have had enough puppy play time, and then I go to my bed (crate) to calm down. I have mastered going up and down the stairs in my house and backyard. I can also get under your feet trying to be by your side so please be patient and watch your step. I rely on my humans to guide me and protect me, so I stay by your side at all times. I am a beautiful girl looking for my perfect forever home and hoping its just right around the corner. Please feel free to ask any questions and these nice people will be happy to answer them! Zoe is available through Canine Pet Rescue in Dacula, GA. To see her Facebook post, click here and to see a video of Zoe click here! Jake is a blind and deaf Catahoula. He’s 55 lbs and is approximately 6 years old. He is a very happy go lucky dog and gets along great for being blind and deaf. He is completely house trained and is even leash trained. He prefers to sleep on the human bed versus the doggie bed. Jake loves everyone he comes in contact with and is good with dogs and cats. He is happy to be petted, cuddle up next to you, or take a stroll around the yard. Jake was most likely born blind (and deaf), as he has microphthalmia which is common in the double merle Catahoulas. He is currently being treated for heartworms, is up to date on vaccinations, and will soon be neutered and microchipped. He has an old injury to his right hip, but it doesn’t seem to hurt him and he gets around just fine and even climbs on my bed all by himself. Jake was found wandering the streets alone and was taken to the local shelter. His owners never came to claim him. Jake is in a foster home and is doing just great and enjoying life while waiting for his furever home. If you are interested in adopting Jake, please email polafoundation@gmail.com or Carla at challengercw@gmail.com. Jax is a great dog, loving and mellow, gets along with people and dogs. Before he got to us, he was in the shelter in KS where he came as a stray. It’s very sad to imagine this dog alone out in the street. He is tall, light, in great shape, has beautiful chocolate color coat and brown eyes. Doesn’t look blind and you would never guess until you see him bumping into furniture. But it doesn’t take him long to learn his way around. He is smart and attentive and tilts his head in adorable way when you talk to him. 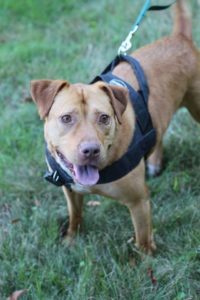 Amazingly, Jax is easier to walk on a leash than any other dog we have – he doesn’t pull forward, he rather trusts you to show the way and stays by your side, often touching you with his shoulder and listening to your steps. He is so nice to walk that you can forget that there is a dog next to you. It’s fun to show him the world around, he is curious, appreciative and very capable of deep connection. Resilience, gratitude, and patience have also come to define Ash. Last Friday Ash was diagnosed with Primary Congenital Glaucoma and within a weeks time he has become blind. No one could have predicted that this would become part of what defines Ash but he has already broken all the stereotypes and quelled all of our worries. He is already begun mapping his living space and learned where his bed is in relation to his wee wee pad, water bowl and how to get up and down from the couch without any help. He is also using his sense of smell and his hearing to ensure he gets his needs met and he has learned to use his beautiful voice (howl) to get our attention when he wants to cuddle or needs extra help. He is surely grateful for these sharp senses. It has certainly been a rough week for Ash but he has taught everyone in his orbit to do better and to be better through his courage and perseverance. What an honor it has been to be his foster family. Sometimes life’s most valuable lessons come from the most unusual of places. Open your heart and your home to this extraordinary puppy who will definitely leave his paw print on your heart for a lifetime. Contact Heavenly Angels Animal Rescue to adopt Ash. Please meet Cinnamon and Blue. These two are a team as Blue (the Pitty) is blind. They are looking for a home together. They are both healthy and have been fixed. All they need is room to roam together. They are both so friendly, cuddly and precious. I met Blue at our last clinic and he seemed to use his sense of smell to get himself around. I was so surprised to see how well he moved and with not much hesitation. He didn’t have any fear and his tail wagged the whole time as he moved from one place to another. As soon as he would come close to a person it was like he couldn’t contain his joy. It was awesome watching him. I haven’t seen how he moves with Cinnamon but have been told that he lets her lead him and that they are very close. The picture says a lot. They are at Animalandia rescue in Loreto, Baja. We will take care of all forms for travel and transportation fees. Click here to see the original post. 19/03/05 Jasper is still looking for his for forever home! Jasper(#125-18) is blind and was a stray who found his way to a kill shelter with his companion. Jasper and his companion, who helped Jasper ‘see’, were sent to a rescue. His companion was adopted, leaving Jasper without a guide and without a whole lot of hope. He was sent back to the shelter alone. This is when Jasper came to the our rescue… and now he’s waiting for his Forever Family ❤ Are you the ones? This special boy needs a special person! Jasper is a sweet 5 year old Border Collie mix. He is a sweet boy who is housebroken and crate trained. Jasper is permanently blind, so he would do better in a home with children 16 and older that can fully understand his needs (he startles if don’t let him know you are there), and a fenced in yard. He gets along well with other dogs, but is understandably a little shy with them at first because of his lack of sight. Jasper is being fostered in Hanover, PA.
Click here to view a video of sweet Jasper. If you are interested in adopting this wonderful boy, please fill out an application. Our friend Duddy is a 14-year old house trained Miniature Pinscher Mix. Despite his age and some other challenges, he has insulin-dependent diabetes and is blind, he is sociable, sweet and has maintained a pup like curiosity about the world. He quickly tunes into what is going on and will vocalize as if to say, I want a treat or I want a walk or I want some loving too. He gets along with most dogs except those who are extremely active since he is not able to see them and avoid being bumped into or stepped on. He has lived with cats in the past and there have been no reported issues. He likes to go out for walks but may need you to watch that he not bump his head as he is eager to get on his way and explore. Duddy has lived in a home environment before but his previous owners were not able to provide the consistent care he needed. Could you be the person he is looking for to live out his elder years? He may need a little extra care but he will pay you back with a personality which you will never forget. If you are interested in adopting or fostering Duddy or just would like more information, please contact Brother Wolf Animal Rescue at (828) 505-3440. 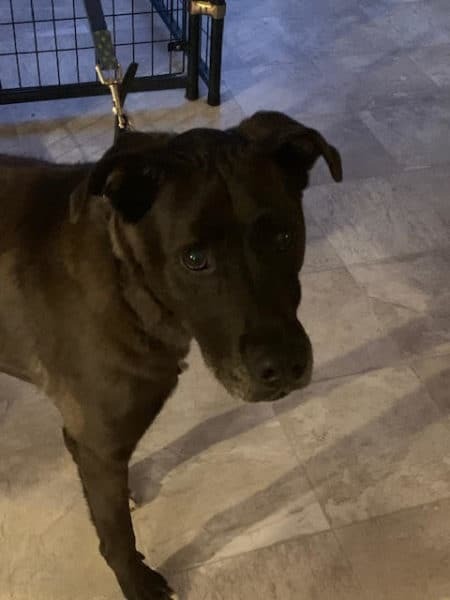 2/26/19 Jack is still looking for his forever home! Jack is a member of AARD, (American Association of Retired Dogs) , a senior dog actively enjoying his retirement years. He’s 9 years young with plenty of energy left to enjoy an active life with a human friend. He has an eye condition which limits his sight. He has been seen by an eye specialist who determined that he can see shadows during the day when the light is bright. This explained how well he walks when out in open spaces with no obstacles during daytime. (Check out the video). In low light and darkness, he behaves more like a blind dog with very limited or no vision. He is currently on nutritional supplements to help his eyes. He may do ok with a well-mannered female dog who does not overwhelm him. He loves his walks, does very nicely on leash, and thinks there is nothing better than a soft bed. He has become a staff and volunteer favorite but is very willing to say good bye to all of us if the right person came along. Living with a blind dog can take extra sensitivity, empathy, and observation to help them succeed and feel safe in a world they cannot see. But for those who choose to take on a special needs dog like Jack, there are few things more rewarding! If you would like more info about Jack, please contact info@fkspca.org. Thank you for caring about dogs like Jack and all other animals in need of love and a family. Jack has been at the shelter for two months, and is now really looking forward to something different! He is neutered, 9 years old, and weighs approx. 50lbs. He is HTW negative, vaccinated, and microchipped. Click here to view a video of jack. Valour is a 2 year old male with an incredible story. This poor dog was euthanized and was discarded but the shelter botched the dose and he woke up. He somehow escaped and was found wandering along a highway. He was rescued and is now looking for his forever home. He does well with other dogs but is a bit hesitant with people (do you blame him?!). Please contact Cuz I Matter Animal Rescue if you are interested in adopting this sweet guy. Check out a video of him here! Phil is a very special dog! Found injured on the street a kind soul brought him to a vet where everyone fell in love with his loving personality and goofy mannerisms. So when it was time for Phil to go, Sochi Dogs stepped in to help him find a home. This sweet boy is only able to use three of his legs, but that doesn’t stop him from enjoying time outside, walking up and down stairs, and playing with other dogs. Phil is an easy dog, he is house trained and walks well on a leash. Phil is in NJ looking for a family in CT that will give him the love and kindness that he deserves. Ideally, Phil needs a fenced-in yard to play and walk around in. Diva is my very special blind foster girl. She entered my life in August of last year and has left a lasting “paw print” on my heart. I was so nervous and scared at the idea bringing a blind dog into my home. I purchased the best-rated raising a blind dog books and did my best to prepare…. but you know what?…my instructor, teacher and friend was able to teach me everything I needed to know and that was Diva herself. She has been blind her entire 7 years of life, her attitude is “I got this and I will show you” and show me she did. Diva showed me she was very adaptable to a predictable environment, Diva showed me just a few carefully chosen words would keep her out of trouble, Diva showed me that all dogs can be off-leash and MOST IMPORTANTLY Diva has taught me to slow down and listen, there is so much to be experienced through the pleasure of sound. Many wonderful folks follow and comment on Diva’s page and her life as my foster dog. They say “you should just keep her” “she looks so happy”. I love Diva. Her perfect forever home is out there. She NEEDS TO BE THE ONLY DOG. I run an animal rescue, there are so many dogs (besides my 4 personal dogs) in and out of my home. She is not comfortable with all the dogs around and just WANTS to be with her “person”. I KNOW her PERSON is out there. Her person will snuggle and love her all day long. Her person will embrace the %100 devotion Diva is ready to give. Her person will be open to learning and loving life even more through the gifts Diva has to offer. When Diva’s PERSON arrives, I will cry tears of joy and sadness. I will cry because I will be so overcome with joy that she will get the life she so rightly deserves and sad because selfishly I will miss my dog friend, my early morning cranberry bogs buddy and my end of the day snuggle partner. Available to adopters in DE, MD, PA, NJ, CT, or MA. 02/25/19 Potter is still looking for his forever home! 10/5/16 update: Potter is now healthy and ready for his forever home! This little guy loves people and loves to eat! 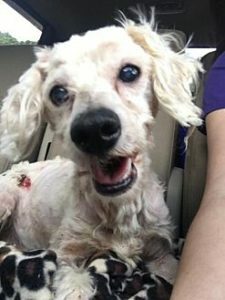 He’s a senior and his sight is not good and seems to be getting worse, so it would be best for Potter to be the only pet and live in an adults-only home. He is paper trained but not completely housebroken. Potter hoards things and loves to sleep on his foster mom’s clothes…he takes comfort from her scent. He likes to rough house with his foster mom. At this point in his life, he basically wants nothing to do with other animals. Potter is a people pooch seeking a retirement home! 10 years 12 lb. Intake Condition: severely matted and crying because it hurts to move. Found maggots eating at him. Blood work was a mess. He was unwilling to eat at first. Clearly Potter was at death’s door when I found him. 7/19 update: Yesterday evening I got home and checked on Potter- he was fine, happy to see me, had eaten most of his special food, had drank lots of water and had peed three times on his puppy pad. A hour later I go back in and run his bath & he won’t stand up, is whining, and is growling at me. So I call doc and we decide that it’s his skin. It obviously hurts. We stop the steroid just in case and gave him some pain medication I had on hand- continue the antibiotics. A little bit later and he was fine so I was sure it was his skin. All checks through the night and this morning he is his regular self. Took him in to see doc for labs and his liver is way off, his WBC count is up and his platelets have stopped going up, so we’re stopping some meds, starting others, changing food, and shooting for an ultrasound tomorrow. He needs a liver biopsy but is far too unhealthy to survive a surgery. So we’re still in the woods. Currently he’s riding shot gun and is pain free. On the bright side, Doc was really happy with how his wounds are healing. 7/21 update: Potter’s liver ultrasound was good. 2019/03/04 Still looking for his forever home! He has no peripheral vision at all, but can see approximately 15 to 20 feet. If you approach him from the side, he does not see you. Of course he supposedly can’t hear anything but I have my doubts on that. They are certain tones, especially loud, low tones, that he will respond to. 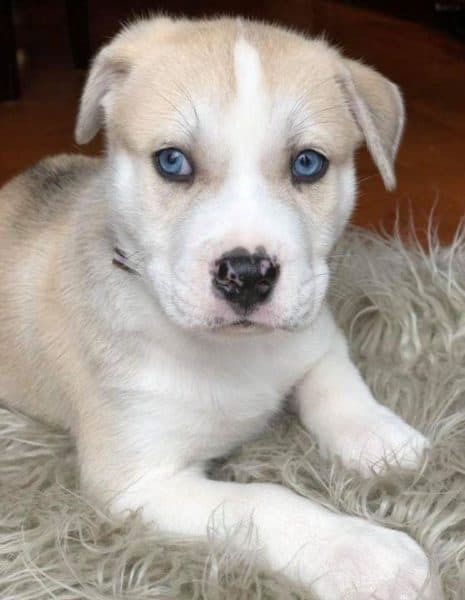 This adoption donation helps to cover the vet expenses for this puppy including heartworm preventive which is dispensed at the initial vet visit and then goes with the dog at adoption. All vet records will be provided to adopter. Chip and his brother Dale come to us together and are very sweet pups! 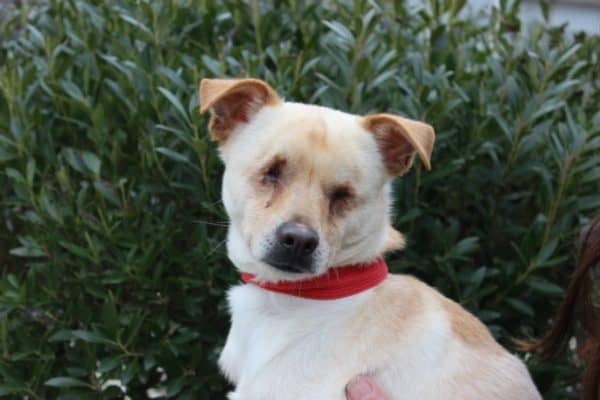 Due to genetic issues Chip is deaf and has limited vision. His Brother Dale is deaf but his vision is ok. They are available for adoption now and ready to start their lives with their new families. They can be adopted together or to separate homes. Deaf dogs do great with some basic training and are wonderful companions! 2/27/19 Charity is still looking for her forever home! 12/3/17 Charity is doing well and has adjusted to her blindness. Charity is a beautiful six year old female Belgian Dutch Shepherd who is blind in one eye and has a cataract in other. She was dumped at a shelter. The current owner rescued Charity from the shelter three years ago. She is a retired search drug dog officer. She will search in soft dirt or gravel but does not dig. She is very healthy. She has been spayed, is up-to-date with all shots and is micro chipped. Charity is good with people but is not recommended for a home with children under the age of ten. She is good with other dogs. She loves to be loved. She will make you laugh and is very sweet.